The American Society for Dermatologic Surgery (ASDS) is expressing its disappointment with the updated skin cancer screening recommendation issued Tuesday by a federal research panel. ASDS believes skin cancer screenings benefit patients. The U.S. Preventive Service Task Force (USPSTF) declined to take a stance on the value of preventive skin cancer screenings for the second time in seven years, saying there is insufficient evidence to make a recommendation on whether the benefits of routine screenings by a physician outweigh the harm. One in five Americans will develop some form of skin cancer during their lifetime. Skin cancer screenings provide potentially life-saving early detection, Lawrence said. 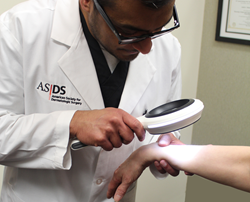 Skin cancer screenings provided by ASDS member dermatologists have proven an effective tool in diagnosing skin cancer. Since 2008, the ASDS Choose Skin Health program has provided more than 20,000 free skin cancer screenings to the public, resulting in a cancer diagnosis for 1 in 10 patients. An important distinction in Tuesday’s announcement, Lawrence said, is that the task force does recommend that adults who have already had skin cancer, those at high risk (e.g., fair-skinned, light eye color or history of significant sun exposure) or those with changes to their skin consult with their physician. Lawrence said it’s important for the public to understand the panel’s findings do not advise against skin cancer screenings. “ASDS member dermatologists are worried the public will misinterpret the findings and avoid regular screenings. Instead, the task force is making no recommendation,” she said. This legislation would require justification for USPSTF recommendations and publication of research plans as well as allow for public input. The recommendation that screenings not be considered a preventive health care service was made by a panel of research experts rather than by dermatologists who see patients regularly.